It has been said that no news is good news. It remains true to this day. Just over the past week, there is news of an aircraft that crashed in a failed landing at the San Francisco airport. Two young high school students died. Over in Singapore, I read about the case of two persons who died in a tragic hit and run incident. Two men, father and son died. Hardly a day goes by without the news media reporting about an accident, a tragedy, a war, or some negative headline. Even within my personal circle of friends, I hear people who experience failures in tests, discouraging job searches, as well as terrible medical results. I also read about people whose children decides to take their own lives. Recently, I hear of someone having an advanced form of cancer! My heart breaks. Call it a bitter pill to swallow or a tragedy. Whatever it is, bad news like any of the above is gut wrenching. My heart goes out to the parents of the two young teenagers who must be wondering right now, why their girls are not among the 305 survivors. They may be asking, why them? Why of all people must they be the ones receiving such bad news? Why of all the girls in the world, it has to be their own flesh and blood who perished? Why on earth must it be Asiana Airlines Flight 214, exactly on July 6th, 2013 that had to crash? There are way too many unanswered questions, and too few answers. The grief is hard to bear. When bad news happens, there are no words to describe the anguish and despair. Only pain, suffering, and lots of tears. What do we do when bad news happens? A) First Person Response: Why me? This is perhaps the most famous question to any form of bad news. The superstitious may start blaming on not responding better to bad omens prior to the tragedy. Maybe they have failed to make amends for their deeds. Maybe, their past has come back to haunt them. Maybe, there is someone who is out to make their lives miserable. The Chinese has a word called (dao mei, 倒霉) which is essentially "bad luck" or "cursed." For those who believe in reincarnation, they will easily blame it on the evils they have done in their past life. Christians of course do not believe in this cycle of births and rebirths, and will be forced to deal with the aftermath in the present and the future. Even among Christians, the two word response is common. For many, the question goes much deeper. Adam Hamilton shares about a man who lost everything during the 2008 recession. Such thinking reflects a commonly held belief that as long as one does good, nothing bad will come. As long as one does evil, nothing good will happen. That is why for people who receives bad news even when they have done a lot of good, it is a bitter pill to swallow and a confusing puzzle to solve. Worse, when they see "bad people" receiving all the good, or simply being lucky, their bitterness increases, lamenting life is not fair. The philosophy of good guys win and bad guys lose does not truly reflect reality of life. B) Second Person Response: Why not other people? Each time someone asks "Why me" there is another related question, "Why not others?" It is a cry for fairness. Sometimes, it is a little easier to accept that one's loved one is not the exception but among the norm. Safety in numbers. At least, if there are other fatalities, one will not feel so bad or alone. Like the case of the Sandy Hook Elementary School shooting tragedy, there are other affected parents who can find comfort and solace with fellow parents who have lost a child to the evil shootings. Better to feel among the grieving than to be alone in the mourning. Imagine how a parent will feel if their child is the "only" one who died, while everyone else survived? Such a parent will very well be asking beyond "Why me?" to ponder about "Why not others?" This issue of fairness and justice is part of the human psyche to want to be treated equally and fairly. The truth is, this world is never fair in the first place. If one is born in a poor region, one grows up poor. If one is born with a silver spoon, one grows up privileged. If one is born with a handicapped, one is doomed to live with that disability for the rest of his/her life. Is that fair? The movie "Final Destination" is a horror flick that talks about how death stalks a person again and again. Once a victim has been identified by a "Death Force," even if the victim is able to avoid the death trap a couple of times, eventually, the victim dies. People who have experienced more than one setbacks in their lives will feel that they are the ones that have been stalked by "bad luck" or evil. Sometimes, our yearnings for fairness can also have a negative dimension. If positive means everyone wins, negative means everyone must lose, equally. Such an attitude stems from a selfish disposition. C) Third Person Response: Thank God It's Not Me? I think some of the most insensitive news coverage happens to be on people who have survived. Just after 9/11, some news agencies will be frantically covering the testimonies of people who survived the terrorist attacks. For some strange reason, a person missed a flight on one of the ill-fated planes that crashed into the twin towers. Another survivor woke up late and failed to attend a meeting. Yet another got caught in some last minute errands. On and on, we read of close shaves and strange out of the blue escapes. This reminds me again the comparison of the praying styles of the tax collector and the Pharisee. The former pleads for mercy. The latter thank God that he is not like some other kinds of sinners. Talk about insensitive remarks. For every piece of bad news, there will be others who sing praises about their good fortune to be alive, or to have been on the "right" side of life. It can be the winner of the lottery, the one who just escaped a brush with death, or simply one who is plain lucky about something. I think it is important that we learn to be sensitive about tragedy situations. Whether one is fortunate or not, the priority must go to care for the grieving. Cut down on the reporting of the lucky people. Avoid bringing God into the blessings too quickly. For with every statement that says: "God has saved me from that fire!" there is a corresponding "Why did God let him burn?" There is no problem in giving thanks to God for the good in our private rooms. When it comes to the public sphere, be extra sensitive on victims, the families of victims, the grieving and those who are suffering. Silence is often a good rule of thumb,on either ends of the tragedy. This third kind of response is not only unhelpful, it is unneighbourly. Angry about bad news on oneself is one thing. Wishing it on others whether directly or indirectly is cruel. What about Job? How did he respond to tragedy? This Bible book alone covers many issues of pain and suffering. It is a story of one who experiences a shift of fortunes from blessed to cursed. After all the upright living and pious spirituality, Job suddenly gets all the bad news. First, his property got stolen by enemies, and several of his servants murdered. Second, his sheep and several servants died when fire from above came down. Third, he lost more livestock, such as his camels. Fourthly, if those losses were not traumatic enough, a fourth servant came to inform him that all his children have died from a wind created disaster. Each time, there was a survivor, the "only one" who managed to escape the calamity and lived to tell Job the story. See how the Bible describes the behaviour of Job. Job did not ask: "Why me?" like many of us modern folks. He did not complain about why the tragedy did not affect other people instead. Neither did he go around shaking his fist at God and cursing the Creator. All he is able to do is to recognize once again the Sovereignty of Almighty God. While losing possessions and the people he loves is one thing, suffering personally through physical ailments is another. In Job 2, we read about the fifth dimension of suffering, that is so bad that Job attempted to scrape his own skin with broken pottery (Job 2:8). The remarkable thing about this man of God is that, through it all, he did not sin (Job 2:10b). E) What To Do When Bad News Happens? What about applying the same question to ourselves? This is a tough one. I do not want to belittle the tsunami of pain and grief when bad news happens to anyone. That said, what I am sharing is for those while stunned, still wants some tips on what to do. That said, let me propose three things that anyone can do, especially Christians. This is what I call the fourth way to respond. First, move toward the Healer. Prayer is a good option. There are many things that are not within one's control. At the same time, the human person tends to be most spiritually attuned to asking the meaning of life during times of pain and suffering. One story that I have recently read is one true story of pain and hurt. Two victims of a drunk driving accident had to reflect over and over again why people like them had to bear the brunt of the tragedy through no fault of their own. It was completely the drunk driver's fault whose vehicle slammed theirs. The drunk driver died on the spot with minimal suffering in terms of time (few seconds), the victims survived but had to suffer for years, even lifelong trauma, or post-traumatic stress disorders. For Dann and Tracey, they had to endure many weeks of emergency operations, months of rehabilitation, and years of pain and suffering. 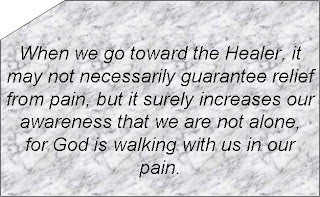 Yet, over and over again, they testify of God's healing presence and the power of prayer. The famous nurse, Florence Nightingale comments about the place of prayer. 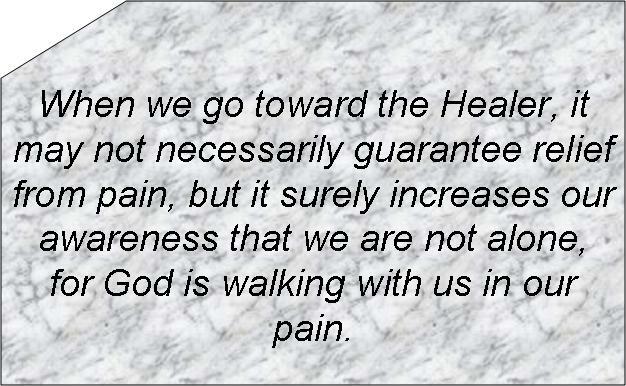 When we go toward the Healer, it may not necessarily guarantee relief from pain, but it surely increases our awareness that we are not alone, for God is walking with us in our pain. This leads us to the second thing we can do. Look outward. As we work toward healing with God as the Healer, and the sole provider of peace and comfort, look on the needs of others more than ourselves. Learn to serve and to give. 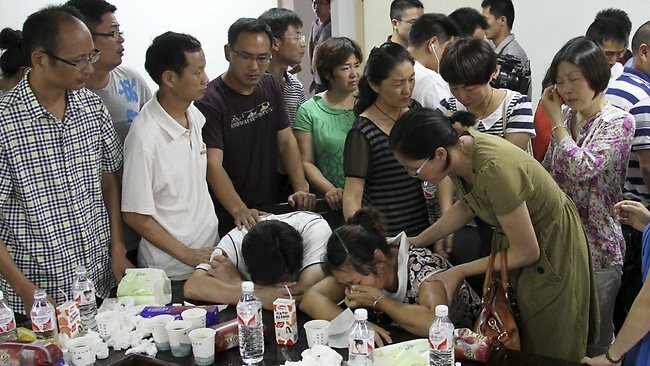 There is a story of a Chinese woman who suffered greatly after the death of her son. On the advice of a holy man, she goes on a journey of searching for some home that has NEVER known suffering. As she knocks on the doors of each household in search of this elusive happy family, she learns that every family has their own share of pain and suffering. In seeking closure and relief for her own pain, she becomes the comforter instead of the comforted; the minister instead of the ministered. CS Lewis shares this insight about the unique place of sufferers. Lewis calls these people "beautiful" those who have suffered. It reminds me of the beautiful feet of people who brings the gospel to people. The gospel is good news, and for those who have heard bad news, the gospel is perfect peace. Yes! Balanced perspective. While it is ok to be grief-stricken for awhile, we need to move on. We need to embark upon a journey of hope, bringing goodness not only to others, but for the glory of God. Let me close with the chorus on one of the best songs to grieve and reflect with. Written by Laura Story, it tells of the song writer's personal struggle through her own spiritual darkness, when her husband was diagnosed with brain tumor. You can listen to this beautiful song here.